Oh buddy, the golden girls are in town! Great picture! I love the light colours! haha.. I love how you made the birds like a cocky girls. great job! I love the expressions and the use of color. Fun. I like the look on the purple birdie... a bit questioning... nice work! 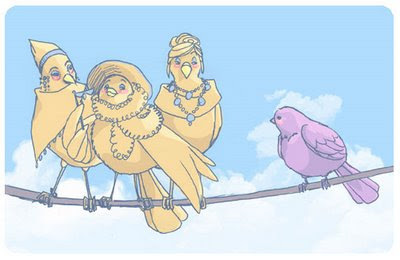 Jepp - those birds sure are Clique, like the illustration! Beautiful illustration. I love the line work and colour.